Mary Frances Healy, a young schoolteacher from Springfield, Mass., volunteered to serve with the National Catholic War Council in the waning days of the First World War. Stationed for sixth months at the Etoile Club in Paris in 1919, Healy helped provide meals, entertainment, and support for Catholic American serviceman awaiting demobilization. After returning home to Springfield, she resumed her teaching career at the Chestnut Street Junior High School. This slender photograph album contains 53 photographs from Mary Healy's time working with at the National Catholic War Council's Etoile Club in Paris in 1919. Healy included a handful of images of the Club's interior taken by a professional photographer, but also includes her own images depicting the staff and the area around the Club along with side trips to the scene of American military action at Belleau Wood and Chateau Thierry, the American cemetery there and the devastation inflicted on the nearby town of Bouresches, and scenes in the streets of Paris, Rheims, and in the Haute Pyrenees. When the United States entered the First World War, Mary Frances Healy elected to suspend her new career as a school teacher to volunteer for duty as a nurse with the National Catholic War Council. The daughter of Henry Francis Healy (1857-1918), a prominent member of the Cigar Makers Union from Springfield, Mass., and his wife Alice Theresa, Mary was born on Aug. 7, 1886. As a staunch Irish Catholic, she was drawn to enlist with the newly-formed National Catholic War Council and left for France in February 1919 as one of a unit of twelve American women assigned. A late entry onto the scene, the National Catholic War Council was organized by the American Bishops in the waning days of the war as an official Catholic Church response to the crisis, and it had little presence on the ground until after the Armistice. It was only a few weeks before Healy's arrival that the Council established a presence in Paris, opening the Etoile Club at 16 avenue Wagram near the Arc de Triomphe. It was an immediate hit, so much so that it became a model for as many as twenty-eight Overseas Houses that followed in France, Belgium, Italy, and Poland. The Etoile Club boasted of having "no rules" and "no don'ts" for the men it served, at least relative to military discipline, and it included recreational opportunities such as billiard tables and weekly dances in a setting that included a dining hall and canteen, rooms for writing and reading, and a library, all at no charge. The Council also supported its staff and other women war workers, providing clean and secure rooms for nurses, "telephone girls," stenographers, and others. The Council terminated its overseas operations in March 1920. After leaving France in September 1919, Healy settled in Springfield and resumed her teaching career. Working for many years at the Chestnut Street Junior High School in Springfield, she died in 1965. This slender photograph album contains 53 photographs from Mary Healy's time working with at the National Catholic War Council's Etoile Club in Paris in 1919. 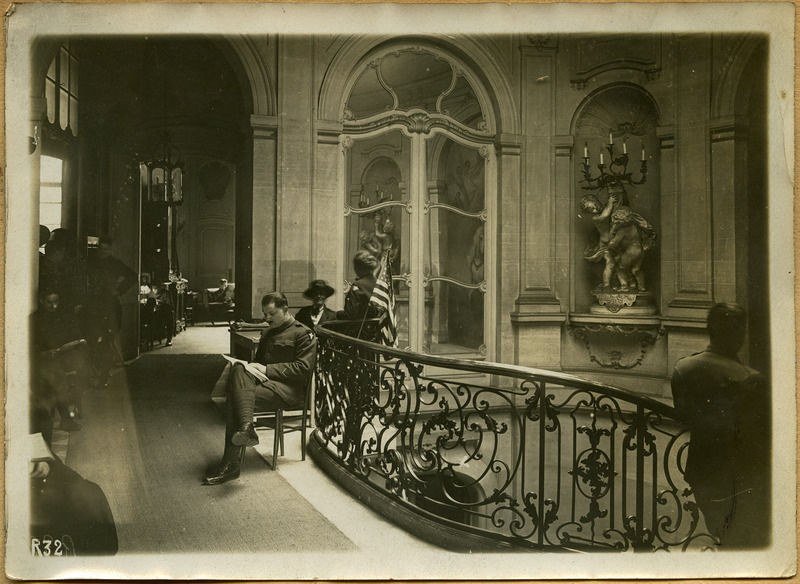 Healy included a handful of images of the Club's interior taken by a professional photographer, but also includes her own images depicting the staff and the area around the Club along with side trips to the scene of American military action at Belleau Wood and Chateau Thierry, the American cemetery there and the devastation inflicted on the nearby town of Bouresches, and scenes in the streets of Paris, Rheims, and Lourdes. Healy's colleague at the Chestnut Street School, Eva Lafond, married Mary's cousin, William A. Bennett of Holyoke, Mass. They were the parents of John W. Bennet ('52), who was instrumental in arranging this donation. The album was donated on Dec. 21, 2015, by Mary Healy's nephew, John Healy of Lakewood, Colo. It was presented in memory of his sister Florence Healy ('48) and his brother Henry Healy ('53), both of lived in West Springfield, Mass., at the time of their graduation. See Marguerite Boylan, "A Catholic service club in Paris," Catholic Charities Review vol. 3 (1919 June): 184-185. Cite as: Mary F. Healy Photograph Album (PH 069). Special Collections and University Archives, University of Massachusetts Amherst Libraries.